Each month, Duncan Sightseeing selects one of Duncan’s Historic Buildings as our Historic Building of the Month. For April 2016, out Featured Historic Building of the Month is 134 Government Street. Many may be surprised by this selection but read on and you’ll find out why we have selected it. This building at 134 Government Street is currently in a somewhat rundown condition. It is currently apartments on the second floor with commercial space on the main level currently being used by the New Bong Shop. This building tends to be overlooked today but when it was completed in 1939 it was considered important enough to warrant a special opening ceremony attended by the Lieutenant-Governor of British Columbia. See A Brief History below. This building was built in 1939 by architect Douglas James for the Canadian Legion, Cowichan Branch. Today it frequently considered an eyesore and many people today are completely unaware of its history and of the fact that this was considered an important downtown Duncan building when it was completed in 1939. It was considering significant enough to warrant a special opening ceremony attended by the Lieutenant-Governor of British Columbia. The new building of Cowichan Branch, Canadian Legion, is an immense improvement over its predecessor. Its size is in keeping with the branch’s increased membership and provides more room for recreation and relaxation. Irregular in shape to conform to the road line, it is 72 feet long on one side, 56 [feet long] on the other [side] and 40 feet wide. The sides are white painted board and the square, imposing front of stucco. Two large windows admit light to the clubroom, which runs the length of the downstairs part of the building and is in two sections, one slightly wider than the other. The front, or smaller section, which is reached through the lobby and cloak-room, is the parlour, with the steward’s room and office separated from it by a partition. Two doors lead off it, one to the cellar, where there is a furnace, air-conditioning plant and refrigerator compressor, and the other to the lavatory. The cellar will be used for carpet bowling in winter. The larger section of the clubroom consists of four full sized billiard tables, bordered by plush covered seats for spectators. Upstairs there is a meeting hall, seating 125, a kitchen, a cloakroom, another lavatory, and a room for the legion Women’s Auxiliary. Previously, the Legion meetings were held in the clubroom of the old building and W.A. meetings in the Agricultural Hall or at the homes of members. The ceilings and the upper part of the walls are plastered. The lower part of the walls being lined with varnished V-joint to a height of six feet downstairs and four feet upstairs. The old building, which was partially demolished to make way for the new, had a 50-year history. It was built on the site now occupied by Wilson & Cabrida’s used car lot, and opened by Mr. James Cathcart, now of Chemainus, as Duncan’s first butcher shop. After six or seven years service as a butcher shop it became a storage shed for Mr. Charles Bazett‘s store next door. Mr. R.H. Whidden bought it in the 1900’s and moved it across the road to establish his wheelwright business. He built several additions to it, and when he sold it to the Legion several years ago it was a patchwork building. The rear part of it was not demolished and will be used as a reading-room and library. It leads off the new clubroom at the back. Erection of the Legion’s new quarters meant much work for the building committee: Messrs. E.S. Fox (chairman), A.J. Castle, J. Shearlow and F.W. Hitchcox. Cowichan Branch, Canadian Legion opened its new quarters on Saturday afternoon – with the Lieutenant-Governor officiating, visiting comrades and Legion officials extending congratulations and everyone happy to see such a suitable building and to know that it had been built without any debt. Mr. and Mrs. Hamber, accompanied by Col. J.R. Kingham, aide de camp, arrived a few minutes after four o’clock, and were greeting in front of the building by a guard of honour of some 30 veterans, marshalled by Comrade R.N. Simmonds, vice president. Comrade C.G. McInnes, president, welcomed the Lieutenant-Governor and accompanied him on his inspection of the guard. Mrs. G.W. Brookbank, president of the Legion W.A. and Mrs. McInnes greeted Mrs. Hamber at the door and Dorothy Fox, daughter of Comrade E.S. Fox and Mrs. Fox, presented her with a bouquet of pink and white chrysanthemums. The Lieutenant-Governor and his party inspected the downstairs portion of the building, and then came upstairs to the assembly room, which was packed with Legion and W.A. members and their guests. Taking seats reserved at the front were Mr. and Mrs. Hamber, Mrs. Brookbank, Mrs. MacGregor Mackintosh (Ganges), Mrs. C.G. MacInnes, Col. Kingham, Comrade McInnes, Comrade R.B. Longridge, Comrade Mayor James Grieg. Comrade McInnes stated that the branch had a membership of 240 and that the building was free of “any indebtedness whatsoever.” he took no credit for this achievement, but said it was dues to the efforts of his predecessors in office. 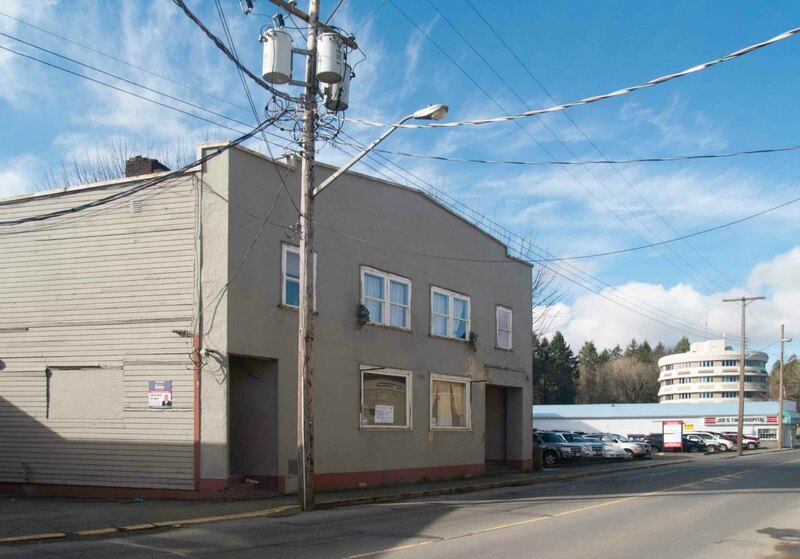 This building has been apartments for many years and is currently configured as apartments on the upper floor with commercial space on the main floor.